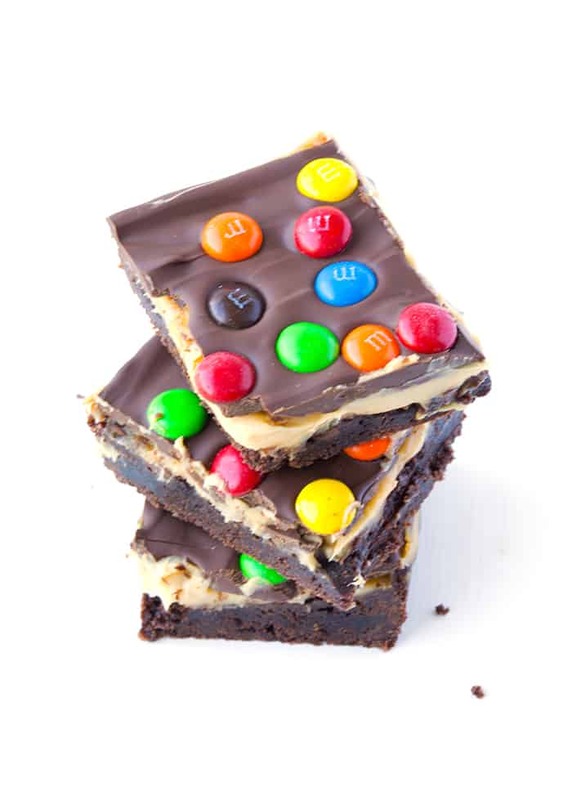 M&M Chocolate Peanut Butter Bars for the win! 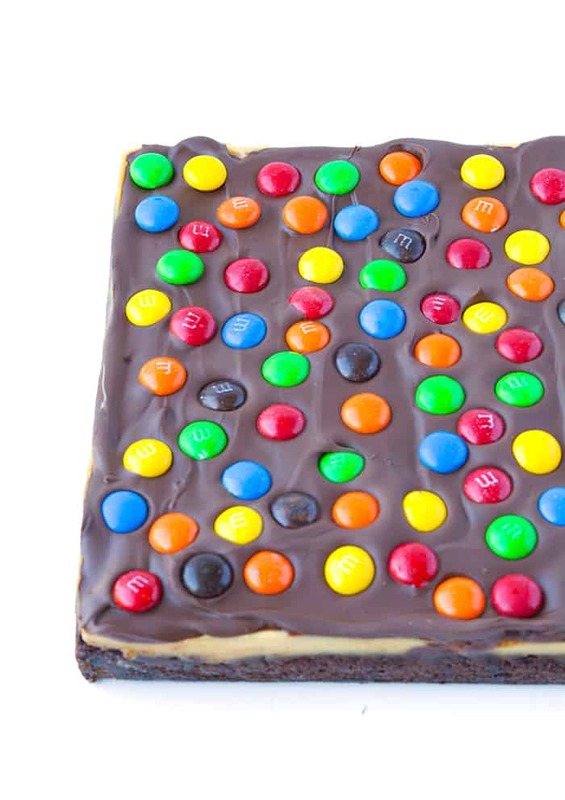 A fudgy and gooey chocolate slice topped with creamy peanut butter ganache, melted chocolate and loads of M&M candy! Did you know you could make peanut butter ganache with just two ingredients? 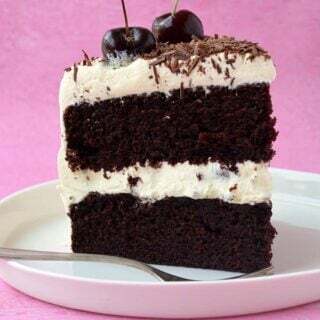 I use chocolate ganache on everything, from layer cakes (like this) to my favourite chocolate slice. But ever since I made my Peanut Butter Poke Cake, I have been all over peanut butter ganache. And what’s not to love about peanut butter and cream? That’s all you need to make the most delicious slighty sweet and creamy sauce. And it pairs perfectly with this extra fudgy chocolate base. 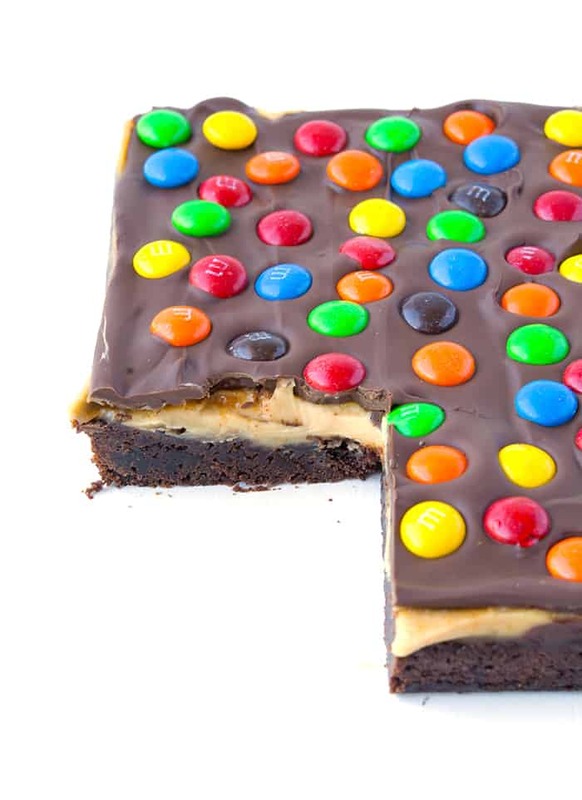 Add more chocolate on top and plenty of crunchy M&M candy and you have the perfect pb and chocolate treat. Cut into small squares for an afternoon sweet or serve with a scoop of ice cream for an indulgent dessert! These M&M Chocolate Peanut Butter Bars actually uses the same base as my favourite Chocolate Hazelnut Slice. 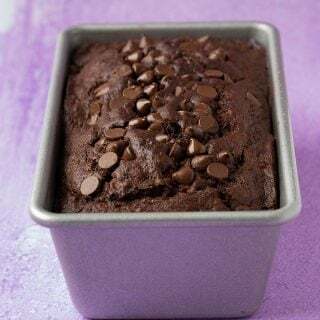 I love it because it produces a perfectly chewy chocolate base that tastes ridicuously good! You could also add in some mix-in’s like milk chocolate chips or your favourite roasted nuts. Once the chocolate base is baked and cooled, you simply pour over your peanut butter ganache. Wait for it to set and then add your melted chocolate. Throw on your M&M’s while the chocolate is still warm and then leave to set. Before you know it, it’ll be time to sit down for a slice and a cold glass of milk. 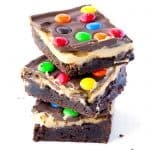 So if you’re after an easy treat that’s chewy and sweet with plenty of chocolate, then these M&M Chocolate Peanut Butter Bars have got you covered. 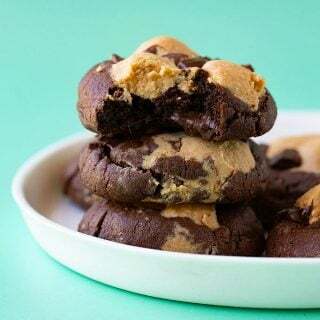 They’re sure to satisfy every chocolate and peanut butter craving you’ve ever had! I will warn you though – these chocolate bars are just too delicious to stop at one piece. Trust me! Which means they are perfect for a party or morning tea OR you could also freeze them for later. Either way, they will get eaten. If you make these, don’t forget to snap a photo and tag me on Instagram – I just love seeing your creations. It really does make my day! 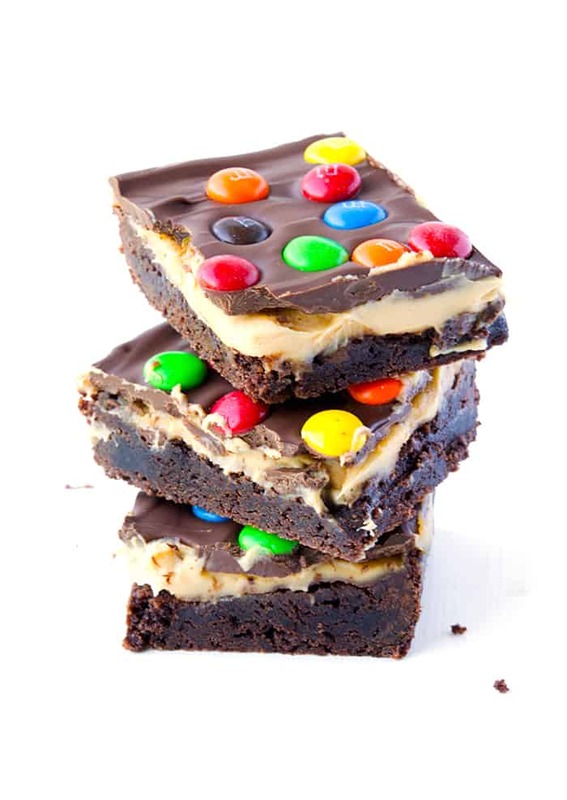 M&M Chocolate Peannut Butter Bars. 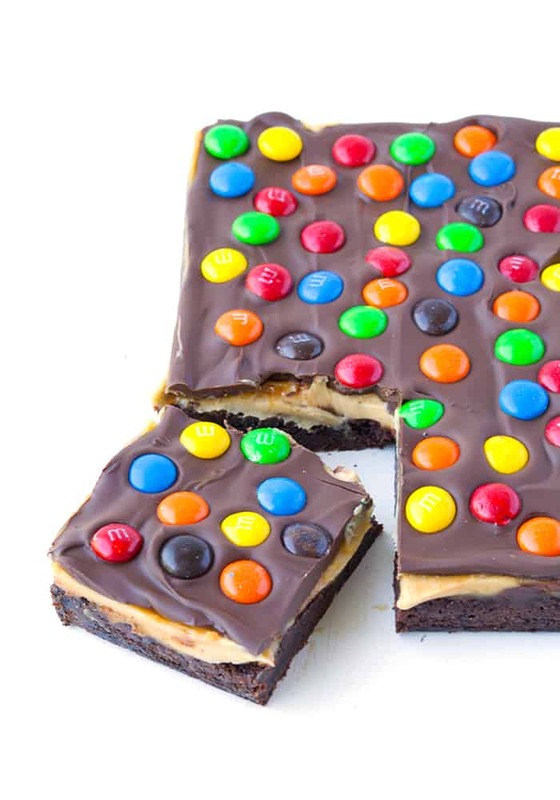 A fudgy and gooey chocolate slice topped with creamy peanut butter ganache, melted chocolate and loads of M&M candy! Preheat the oven to 160 C (320F). Grease and line a square 8 inch baking tin with baking or parchment paper. In a large mixing bowl, add the butter and sugars and beat until pale and creamy. Add the vanilla and egg and beat again until combined. Sift in flour, baking powder and cocoa powder and stir until combined. Place the chocolate batter into your prepared tin, spread out into one even layer and bake for 25-30 minutes or until a skewer inserted in the middle comes out clean. Transfer to a wire rack to cool completely. To make the peanut butter ganache, add your peanut butter to a bowl. Pour over the cream and the pop in the microwave for 20 second bursts, until the cream is warm to the touch, but not boiling. Whisk until peanut butter and cream are smooth and creamy. Pour over your cooled chocolate slice and place in the fridge for at least 1 hour. Melt your chocolate in the microwave, stirring every 20 seconds until smooth. Stir through oil. Then pour the chocolate over the peanut butter ganache. 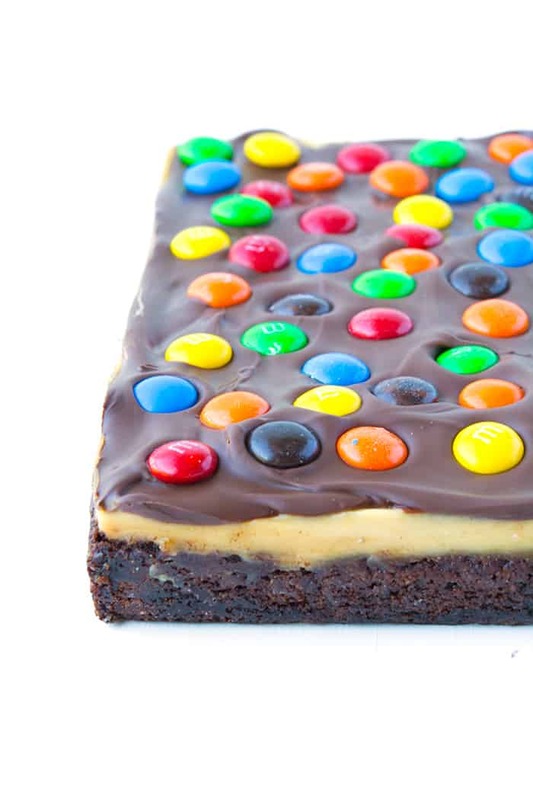 Press your M&M’s into the top of your slice and leave to set. Slice into small squares and enjoy! So pleased you enjoyed them Josh! 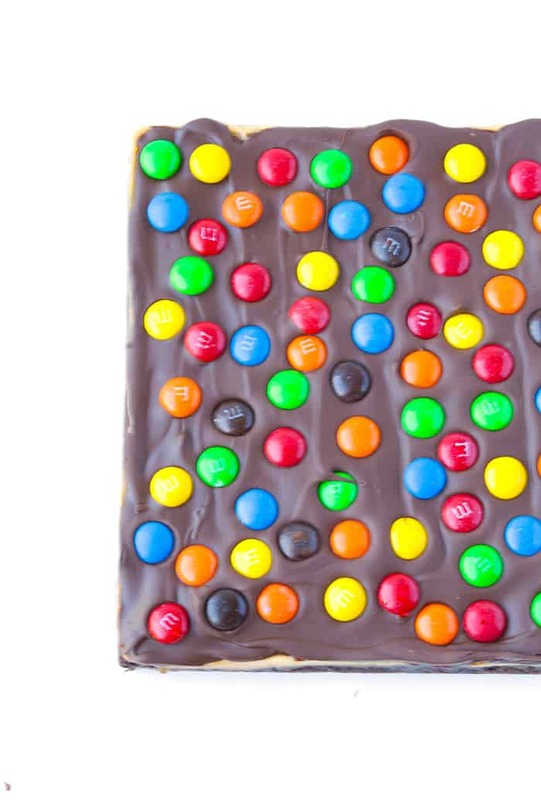 Did you ever have those bars as a kid that were like a biscuit on the bottom then chocolate and M&M’s on top? (I think they had a twix version too!) For some reason when I saw these, I thought of them! These look deeelicious! I’m going to have to find some US M&M’s and make a GF version!